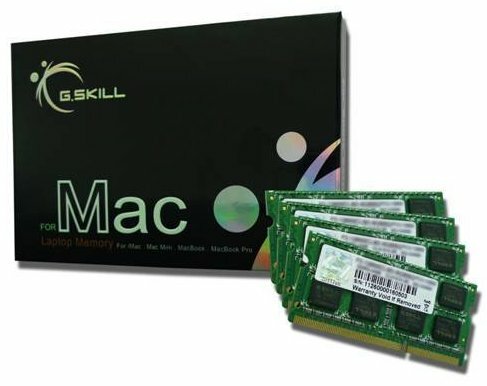 G.SKILL, the worldwide leading high performance memory designer, has released the 32 GB DDR3 1333 MHz laptop memory kit for Apple iMac 2011. The G.SKILL 32 GB Mac laptop memory kit, consists of 4 matched 8 GB DDR3 sticks, has passed G.SKILL's rigorous compatibility and reliability tests with the latest Apple iMac 2011 machines for guaranteed performance. Taking the full advantage of 4 memory slots on iMac 2011 machines, G.SKILL 32 GB Mac memory kit is the best-in-class memory solution for Professional graphic, video and audio editing and other professional applications. The new 32 GB memory kit for Apple iMac 2011 is available now through G.Skill's authorized distributors and resellers worldwide. For detailed product specification and compatibility information, please visit G.SKILL website.